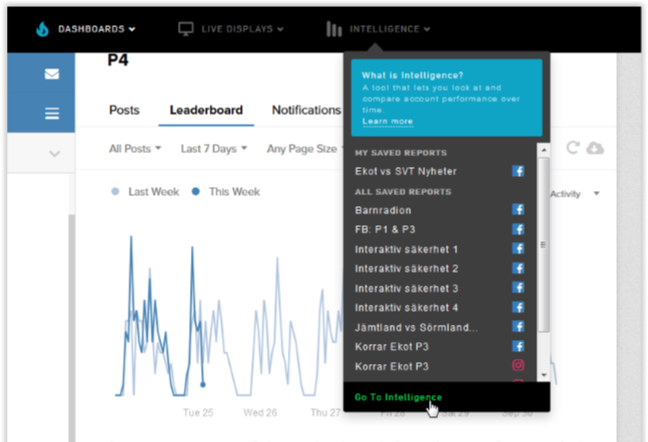 In the Intelligence view, you’ll find detailed statistics about your page/account: interactions (likes, comments, shares), interaction rate, video views and the number of page likes/followers. In the Search box (marked in red below), select the platform (Facebook, Instagram, Twitter, or Reddit) and up to ten different pages/accounts that you want to compare (or just your own newsroom’s/department’s pages/accounts). 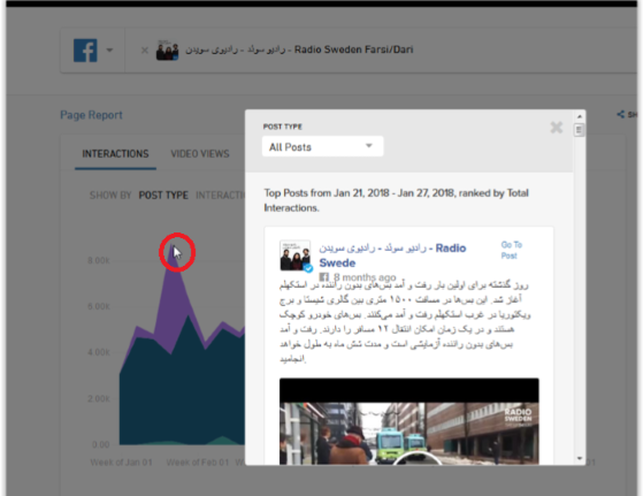 On Facebook, you can obtain statistics for both pages and groups. 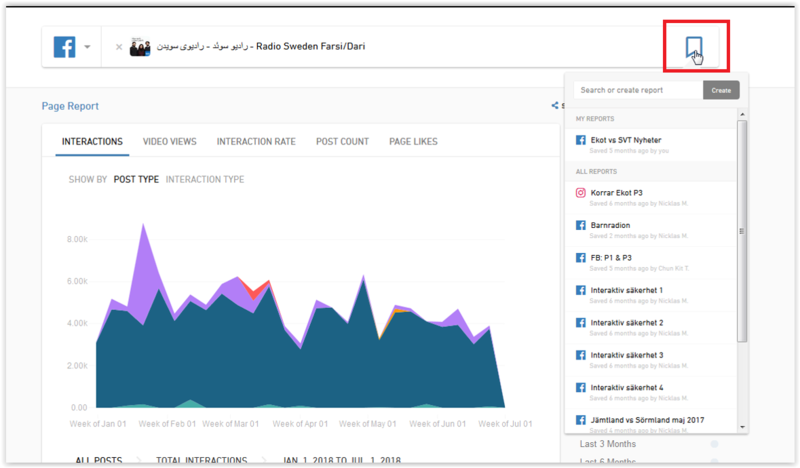 If you are a newsroom with definite competitors for example, you can compare your pages/accounts with theirs. In the right-hand column, you can filter your search, for example by different Date Ranges. 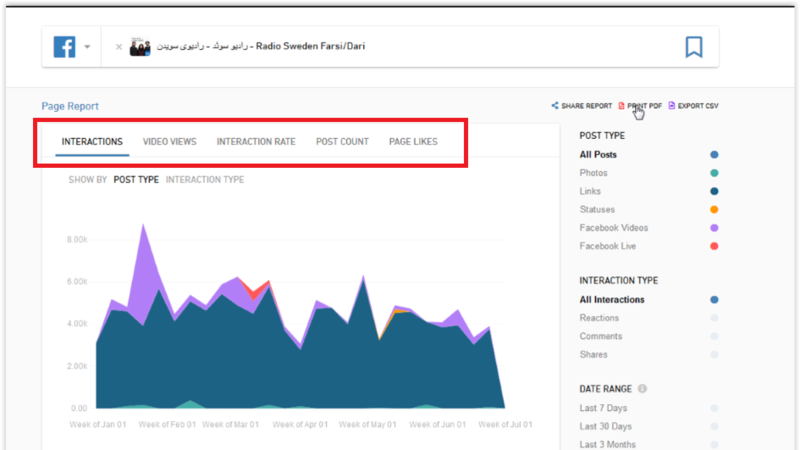 The number of interactions can be divided into different types of content (images, videos, posts with links), and into likes (and other reaction types on Facebook), comments or shares. The graph has clickable measurement points (peaks and valleys). If you want to see what contributed to a peak in your newsroom's/department’s statistics, point to the peak and click on it to display a list in a new window where you can see the posts that generated the most interactions. If your newsroom/department uses specific statistical comparisons in Intelligence over time, don’t forget to Save! Click on the tab to the right into the Search box, give your report a name and click on Create.